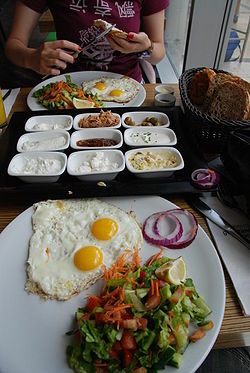 An Israeli breakfast typically served in hotels consists of coffee, orange juice, fresh vegetables salad, goat/cow cream cheese, fresh bread or toast, olives, butter, eggs and omelets of your choice, and some small cookies or slices of cake. Attendees who will book hotel reservation through the organizers will receive an Israeli breakfast as part of the accommodation deal. Attendees who will stay at the dorms will receive a continental breakfast (coffee and croissants) at the venue every morning before the conference. This page was last edited on 9 May 2011, at 14:25.